The super storms, floods, extreme melting of the world glaciers and ice caps, excessive heat and drought, and strange shifts in world weather patterns have finally snapped a lot of people to an awareness that those long-quoted "experts" were wrong. The world is heating, the weather is changing and our excessive burning of carbon fuels appears to be a major factor. Consequently, the industries that rely on coal, oil, ethanol and other carbon fuels are planning ahead for their survival. Notice the clever bombardment of televised promotions of "clean coal" as the key to America’s continued supply of cheap power to operate our factories and electric generating plants. No matter what they tell us, there is no such thing as clean coal. It can be burned under costly controlled conditions that reduce the carbon in the exhaust that leaves the stack. But companies are reluctant to pay the cost of installing and using "scrubbers" and because they have well-paid friends in high places, nobody is forcing them to do it. Notice also the promotion financed by British Petroleum that attempts to attract tourists back to vacation spots along the Gulf of Mexico following the disastrous oil spill and fire on a company drilling rig in 2010. "Come on down," the promoters say with smiling faces. "The fishing is great." Anybody keeping up on environmental events knows better. The oil is still in that water and the sea life that once provided a rich supply of food for America is found to be deformed and filled with toxins. An acquaintance that recently flew into Tampa on a business trip told us she could still see the oil on the surface of the water from the aircraft window. Some believe crude oil is still seeping from the damaged well head. Never in our history can we remember this level of reckless effort at mass manipulation of the people. We are seeing it in the constant bombardment of political ads that wildly attack political opponents. The Supreme Court’s controversial Citizen’s United ruling opened the door to multi-billion dollar shadowy ad campaigns against candidates that refuse to get in lock step with big business interests. Most of these spot ads are laced with half-truths, twisted information and bald-faced lies. Do the people believe all of this propaganda? We believe it must be working because the barrage of these promotional ads has not stopped. People must be rushing to the Gulf Coast to vacation. The campaign to replace coal with clean green fuels has been slow to work its way into the political races. Most candidates for the 2016 Presidential race are avoiding the topic altogether. And if these things are true, then it is highly possible that Americans will walk in lock-step back to the polls next fall and return the corporate-owned "lawmakers" back into power. Ignoring world environmental concerns is not a good stance for U.S. political leadership; nor is the reckless banking policies and heavy military investments that are generating a multi-trillion dollar deficit; or our insistence in becoming a world empire. These are dangerous and costly policies that are being carried out on the backs of working Americans who don’t seem to understand that the so-called “American dream” has been snatched from under their noses. The Republican call for slashing federal spending, balancing the budget and creating lots of jobs appears to be an impossible dream because of the way they are going about it. The money is being earmarked instead for the military industrial complex and keeping the big banks solvent. There is nothing left for developing the badly needed green energy systems, updating our worn out infrastructure, restoring our defunct education system and providing for the poor and elderly. Even the severely injured veterans limping home from the wars are getting left without the help they desperately need and deserve. If the radical Tea Baggers follow the program they have used in the past, we are in for more war, more military spending, and a continuation of the War on Drugs. That means more spending for police, jails and prisons. There appears to be method in the silly clown-like G.O.P. presidential campaign that has been dominating our "news" more than a year before the 2016 election. The Republicans know they have a majority of the states under their control. We can expect a hard campaign to maintain control of the House and Senate next year. They have already shown that it doesn’t matter who wins the presidency. With the Supreme Court under right-wing control, the G.O.P. has the power to keep Washington politics in the deep freeze for another four years, if not longer. What this means is that if American voters continue to allow themselves to be manipulated by clever big-corporate advertising campaigns and keep electing fake representation for their home districts, the United States government will exist in name only. The key decisions will be made by power brokers in a shadow government that buys its way into positions of leadership. If conditions get worse, if more and more Americans lose their jobs, their pensions and possibly even their Social Security and Medicare benefits, if more and more people are forced to live in the streets and go hungry, will they revolt? The banksters are gambling that they will not. 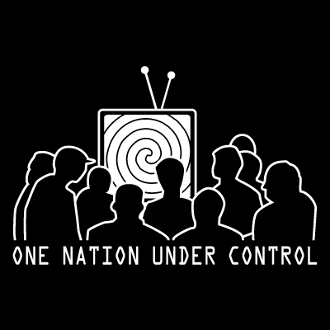 Mind control has become the key to politics, religion and big business in the United States and all of the other industrialized nations of the world. It has become a highly studied science whose practitioners utilize their skills in advertising agencies, from behind the curtains of government and in the corporate board rooms. These pillagers of our right to free thought and liberated life style used to be much more subtle in the way they went about their business. It was a slow process beginning with the church, our public education system and the advertisements that packed our printed news publications and radio programs. The advent of television opened a whole new avenue of propaganda that has become more and more specialized. Today it is almost impossible to escape the constant campaign to make us buy certain products, elect certain candidates, and accept certain ideologies without ever questioning their validity. The propaganda slams our brains where ever we go. It comes at us over our car radios on the way to work. Of course it dominates the television programming. The ads scream at us from billboards, from the sides of trucks and buses, from behind athletic fields and across the bottom of our computer screens. It has gotten so bad that most of our television time is spent watching back-to-back television ads instead of the program we tuned in to watch. If you watch a ball game, the background behind the bleachers is lighted up with advertising. Automobile race cars are decorated with the brand names of sponsors. Film producers are paid well to use certain brands of cars, beer, food and even shampoo in the movies we watch. We are forced to pay for special devices that attempt to block those nuisance "pop-up" ads that invade our computer screens, but many of them find ways to get through anyway. Former President Herbert Hoover, who went down in history as the president in office when the world was hit by the Great Depression, also understood what was about to befall the nation. As a Republican he perceived it as a good thing in his day. He said: "You have taken over the job of creating desire and have transformed people into constantly moving happiness machines; machines which have become the key to economic progress." Those were the days when newspapers were the primary source of information and radio was in its infancy. Oh what extremes it has all gone to since then. While they probably don't realize it, but most Americans today go through their lives without entertaining a single original thought about anything.